Author and dream interpreter J.M. DeBord is a popular media guest. Click for bio. DreamBoat Podcast: Two young guys interested in dreams invite this old pro to walk them through the process of dream interpretation. Great show, great audio quality, many subjects covered. Beyond Midnight Podcast: Deja vu, precognitive dreams, past life dreams, dream sharing, dream symbolism, Edgar Cayce. Mystic Paranormal Podcast: Night terrors, dreams about your ex, Donald Trump dream, dream symbolism. 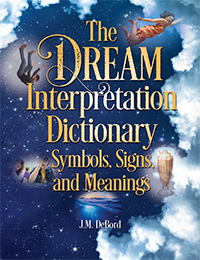 Intuitive Ink w Servet Hasan: The Dream Interpretation Dictionary, my extraordinary dream experiences, demystifying dream interpretation, recurring dreams. The Higherside Chats: The unconscious mind, symbolism of aliens and UFOs in dreams, zombies, symbolism of home. House of Mystery: Recurring dreams, dream interpretation. Preferred Company Radio Show (MP3 download): The basics of dream interpretation, the unconscious mind, interpreting symbols in the context of the dream-story, bad haircut dream, driving to airport dream. Linda Strasberg InterViews: Finding answers for your life in your dreams, how to truly “live your dreams,” memory consolidation while dreaming, precognitive dreams. Health & Happiness w Kacey: Dreaming about an ex-boyfriend from long ago, how dreams exaggerate to make a point, anxiety dreams, numbers in dreams. The Christine Upchurch Show: Dreaming about the future, using dreams as guides for life, interpreting dreams and dream symbols. Conscious Living w Wendy Garrett: Dream analysis/dream-story analysis, precognitive dreams, connecting dream symbols. Wendy’s Coffee House: Connect together dream symbols, precognitive dreams. Even more media appearances here! How to Decode Dream Symbolism | Video Presentation: Understand Dreams.